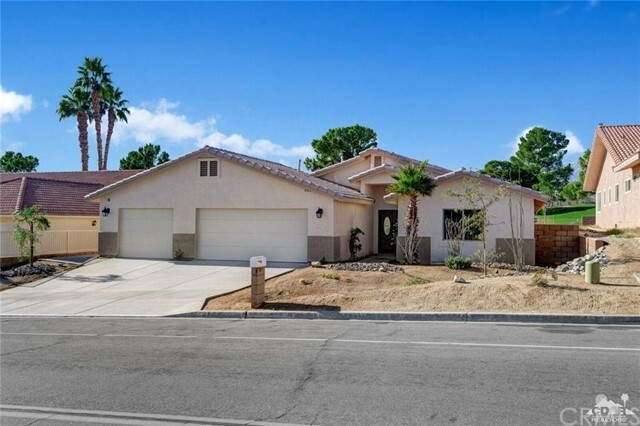 All Desert Hot Springs homes currently listed for sale in Desert Hot Springs as of 04/21/2019 are shown below. You can change the search criteria at any time by pressing the 'Change Search' button below. 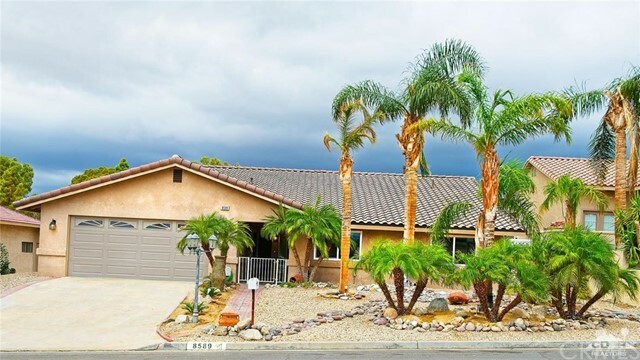 If you have any questions or you would like more information about any Desert Hot Springs homes for sale or other Desert Hot Springs real estate, please contact us and one of our knowledgeable Desert Hot Springs REALTORS® would be pleased to assist you. 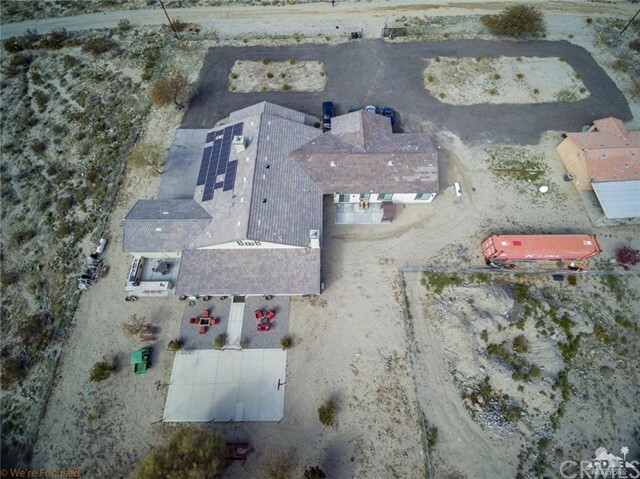 "Magnificent Hacienda estate, 5600 square foot under roof, on 3.5 hilltop acres fenced featuring 360 degree views of the Coachella Valley; along with a 4 bedroom and 4 bath guest house, 2700 square foot Desert Modern on 5 acres, fenced with automatic gates with 1000 square foot patio and additional 1000 square foot party deck above and there are three additional 5 acre parcels, un-fenced. Perfect for luxury living, family/team business or vacation destination. 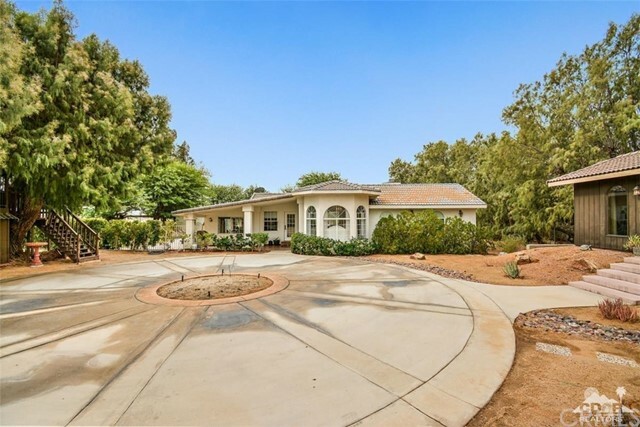 The hilltop home features a multitud"
"Bubbling Wells Ranch is a 107 acre estate located on historic Miracle Hills in Desert Hot Springs just 12 miles from downtown Palm Springs and an easy 2 hour drive from Los Angeles. Desert Hot Springs is internationally known for its natural healing hot mineral springs and also claimed to be situated in a vortex that promotes health and wealthiness. 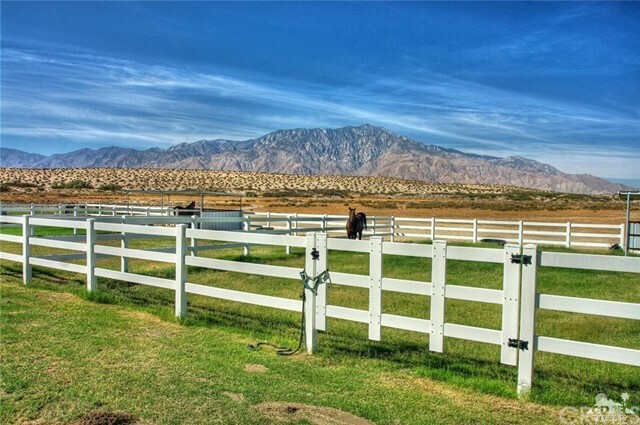 With elevations from 900 to over 1000 feet and overlooking the historic Two Bunch Palms Resorts, Bubbling Wells Ranch is an ideal location for a wor"
"Equestrian Business Opportunity at THE WILLOWBROOK RIDING CLUB, in DHS. Operating for more than 20 years as a boarding/training/lesson/Horse show facility, the Conditional Use Permit for Equestrian Center/Tack Shop has approx. 40 years remaining. Zoned W2, controlled development, and allowing a maximum of 200 horses, there are 2 permitted homes. The main home was built in 1988 offering 3 beds/2 baths, in approx. 1556 sf. The Permitted addition was added in 2002. 5 Arenas (one covered), multiple "
"Seller says let's consider back up offers. Price adjustment brought about by remodeling area of this piece of Hollywood's history. This compound was once owned by Mary Pickford, star of the silent movie era. The property consists of the main home,an oversized garage that has 3 large stalls and 2 huge office spaces separated by a full bath done up in Italian tile,a guest cottage with fireplace and full kitchen and a maids quarters that has its own kitchen. The main home of approximently 5,100 sq." "A rare spectacular estate with 3 homes that lies on 8 acres. One custom home that is 5bd/5ba (3944 sq. 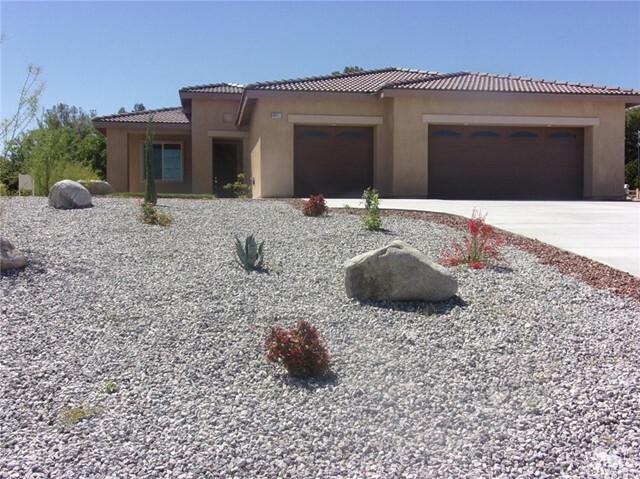 ft) and an attached additional home with kitchen that is 3bd/2ba (1750 sq. ft) for a total of 5717 sq ft custom home. This lovely home features granite counters in the kitchen and baths, stainless steel appliances, large bedrooms with walk in closets. The floor plan is open with a large kitchen which opens to the living room for easy entertaining. Centrally located within minutes of main attrac"
"Classic Car 10 car garage with clean out. Seller garaged a Mercedes Gullwing, pictured and other classic cars. Also Water well, 10 AC ESTATE WITH OWN WELL AND CITY WATER! Indoor pool, a rarity in the desert with spa. 8 car garage for your classic car collection + 2 car garage for your daily driver and a carport. 16 rooms; home gym, 5 bedrooms, 4.5 baths. Extensive remodel in 2009. 3 sets of gates for the compound with built in alarm, washer/dryer, range, oven, refrigerator. Attached guest quarte"
"RARE 15 acres close to town with a main house and 1br/1ba guest house!! This unique, one of a kind property is just waiting for the right buyer. It is like country living but close to all the amenities. The main house offers 5br/3ba. The guest house is a full 1br/1ba with kitchen. The property features a swimming pool, lit basketball court, tree house, fire pit, horse corral, lots of parking, and semi-built game room with viewing deck...The possibilities for this estate are endless. It is great "
"Located in Sky Valley this beautiful Santa Fe custom built home sits on 5 acres with spectacular views of the surrounding mountains. Spacious interior with lots of privacy. There is a 40x60 steel building perfect for the car collector, contractor, etc. with 10x14 ft. roll up doors to accommodate two 45' RV's, 50 amp. pedestal & dump. Full bath in shop, 50 amp. RV hookup on outside of shop. 6500 CFM swamp cooler for shop. 100 amp. panel in shop. For the house - 400 amp. main service with 200 amp." "Newer Lovely Desert Retreat Estate or Ranchette! Zoned W-2-10 for Multiple uses; Nursery? Horses? Hard to find Modern Custom property on nearly 5 Acres with partial 6 ft Block Wall with Gate. Privacy encompass this unique location nestled across Natural Habitat Preserve. No front neighbors. 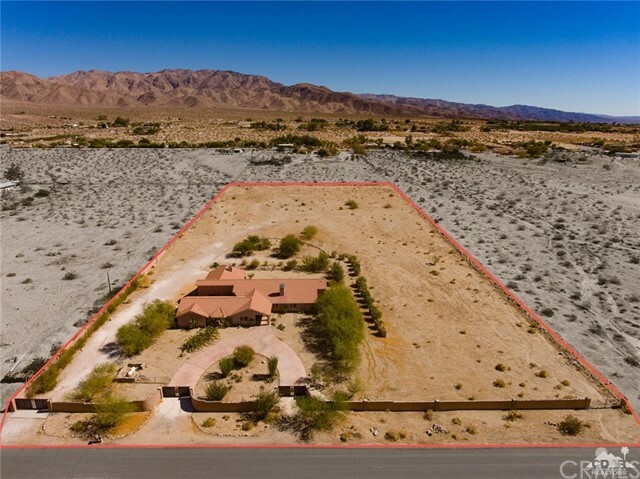 Breath taking 360 Unobstructed Desert and Mountains views. Detached 1500 sq. ft. 4 Car Garage. Plenty of land for RV, Boats, Trucks, Equipment and Toy Haulers. This Beauty boasts over 3000 sq. ft., with Custo"
"In a serene setting near The Coachella Valley Preserve, endless opportunities await at this sprawling, high-end custom 7 bedroom estate on nearly 5 acres. Step into the Great Room with soaring ceilings and adjacent formal dining, which is the center of the home with slate floors throughout. Watch the sunrise from your breakfast nook in your large kitchen with island, stainless appliances, maple cabinetry and granite counters. The 7 bedrooms in 3 separate wings have an oversized walk-in closets a"
"4 Bedroom, 3 Bath, Extra Long 3 Car Garage on 1.08 Acres. Looking for the perfect natural getaway but would like to be close to town? 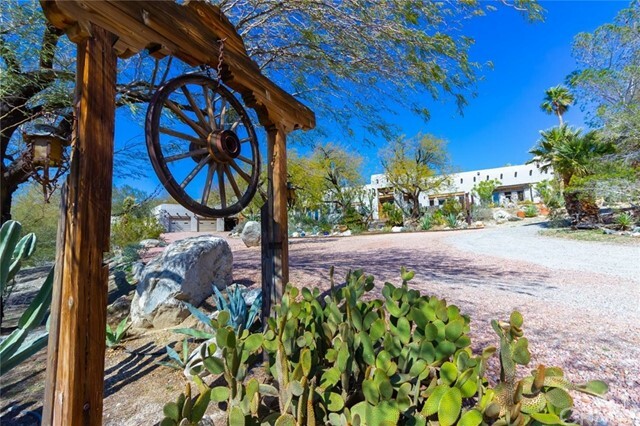 This desert paradise has a mineral water well, amazing panoramic views, and easy access to hiking/riding trails! W-2 zoning allows for 5 horses per acre. This property is only 20 minutes from the Palm Springs Airport, but has exceptional privacy and beautiful low maintenance desert landscaping. Other notable features include a living room with high vaulted ceiling"
"Beautiful single family home with detached garage. 900 sqft shop with 10,000 lb automobile lift. RV Parking with a 30 amp RV outlet. Home is well kept up with central air and heating as well as a evaporative cooling. Landscaping is extensive with ficus and washingtonian palms All this on one acre running from 5th to 4th street within four block of 4 restaurants and down town. Home features an outdoor fireplace under a covered area for family fun and gatherings. 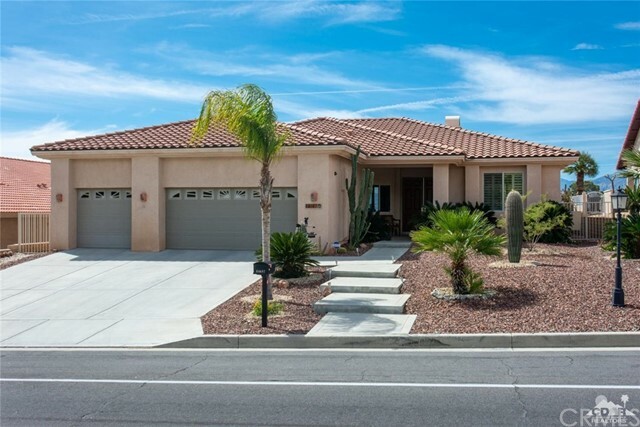 Home also has a halh bath on lower"
"*1 year old SOLAR SYSTEM is fully PAID FOR - Annual electric savings of $3,500 +/-*Former Estrella Model home offered for sale. Designer Decorated, along with one of the best Locations in the Gated Community of Mountain View! *Beautiful Panoramic mountain views. *Reduced Taxes due to paying off Sewer Bond. *Upgraded Full Splash Granite Countertops in the Kitchen along with Island. *White Plantation Shutters on windows and French Patio Doors throughout the house. *Custom gated courtyard Door. *Upgraded"
"EASTER SPECAIAL , SO you looking for that special one-of-a kind property that offers your own mineral water well and views for days .This is it. 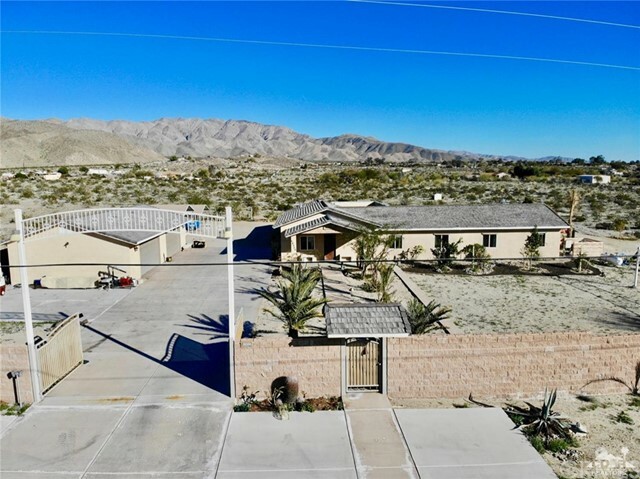 This property has a country feel while being just minutes from anywhere in the Coachella Valley. Here is your chance to own this exclusive, beautifully remodeled 3-bedroom, 3 full bath 2154 ft. home on 1.25 acres. This homes features 2 master suites and the list of new upgrades include: a completely new roof from "
"Spanish Hacienda meets New World in Mission Lakes. Wonderfully updated home that overlooks the golf course, lake and sprawling mountain views! Uncommonly high ceilings in living room, rock fireplace with hearth, built in bar with granite countertops. Wonderful gourmet kitchen with extremely large amount of cabinets, granite countertops, fantastic over-size covered patio, lovely dining room overlooking the lake and golf course, wooden shutters. Master bedroom has its own cozy fireplace, wood shut"
"Brand New Model Home with Double RV Access!! Brand New Construction, Don't Wait! THE Sooner you buy, the sooner you can pick out your custom options or even put a pool and spa in your backyard to make your purchase special! This Unique Four Bedroom, 3 Bath Verbena Floor Plan is one of hottest looking floor plans available in the lovely Gated Community in Mountain View. Luxurious formal dining room and grand casual great room area creates a lovely comfort home and livability. 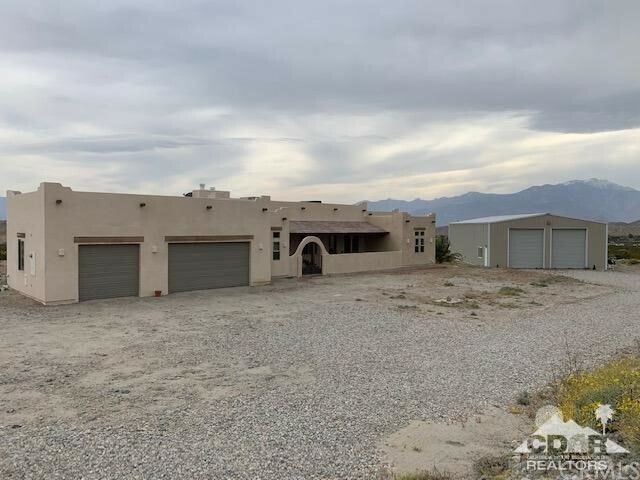 This house will have"
"Location, Location, Location, this amazing Six Kids Construction custom home, premier lot on the 13th tee and it overlooks the Santa Rosa Mountains. Gourmet kitchen with granite slab counter tops with a center island with a sink. Fireplace that overviews the golf course. The master bedroom/suite has a soaking tube and a separate glass shower stall. Dual sink vanity. Plantation shutters throughout. Wayne Dalton insulated garage door, overhead plumbing, maximum insulation throughout the house and "
"This brand new home features nearly 2200 square feet of open living space on the Golf Course, gorgeous views right out your windows. Huge open floor plan with large entry and vaulted ceilings. Tile floors, upgraded carpet in all 4 of your bedrooms, ceiling fans throughout. Energy efficient appliances to include a dutch door refrigerator. 4 Bedrooms 3 Full baths with two rooms joined with a Jack and Jill bath, dual vanities in two of the baths. Sliding glass doors from your kitchen nook and Maste"
"Beautiful Bella Plan with Three bedrooms and two baths in Main house, and a casita with private entrance with closet and bath, makes a great office, hobby room, or guest quarters. Beautiful private 55' pool with spa and two waterfalls. Huge 11,761 s.f. lot. Low Maintenance landscaping with several fruit trees. Large family kitchen with breakfast bar and nice dining area. Great room has media center and lovely fireplace for ambiance. Located in the senior portion of gated community. 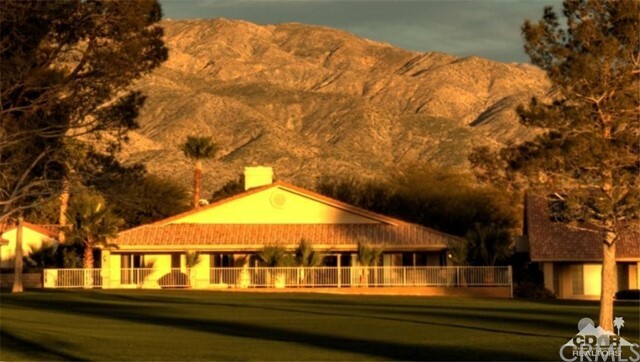 In addition t"
"Beautiful golf course property with Spectacular views This Golfers Paradise is what Coachella Valley living is all about. You will love the unlimited golfing, on the Ted Robinson designed premier golf course, which is included for two on the title in the low homeowners dues of only 320.00 a month. Premier location on the the fairway in Mission Lakes Country Club, offers year around spectacular sunsets and views of both the San Jacinto and San Gorgonio Mountains. The home has a great flow and is "
"New home you say, but the assessors date is 1980. True, but the home burnt down and was rebuilt early 2018 (driveway is vintage).If you do not want to deal with aging home issues, you love an open concept high ceiling kitchen/family room, all new appliances, with that new home look and feel check this one out. The home is a 3 bedroom that can be 5 bedrooms with 2 baths. Disability access features through out the house- wider hallway/doorway, walk in shower in master, auto lights in bathrooms bes"
"When you think of your perfect home, it includes a relaxing setting, a wonderful house, lots of friends, and beautiful views. This house has it all! Recently remodeled, everything new. Open floor plan, large open concept, modern kitchen with island and lots of cabinets, extra pantry, lots of light, laminated floor. 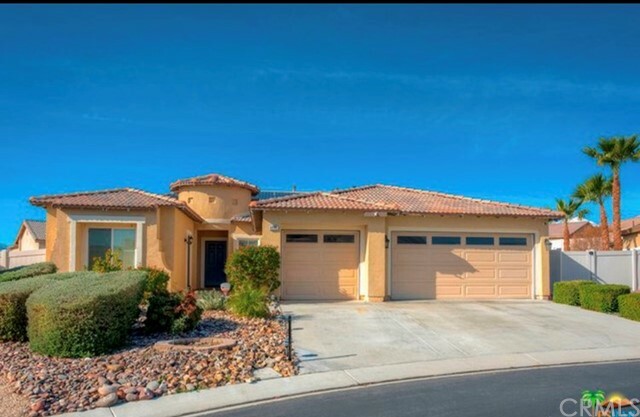 Three bedroom with their ow"
"Let this be your Brand New Home in Mission Lakes Country Club one of the best kept low HOA golfing secretes in the Valley. Home offers a 1871sqft open floor plan with 9' Ceilings, beautiful wood laminate flooring throughout and ceiling fans in all rooms. The new kitchen offers quartz counter tops and new stainless steel appliances, refrigerator, gas stove dishwasher and walk in pantry. There are 3 bedrooms, 2 Bathrooms and Den/office off living area. Master has walk in closet and slider to the p"
"An absolute gem! Spectacular panoramic mountain view home with 4 bedrooms 3 baths, 3 car garage, a chef's kitchen, custom cabinets stainless steel appliances, 18 ceramic tile diagonal tile throughout, 10 ft ceilings, mirror closet doors, dual A/C's, ceiling fans throughout, energy efficient windows and doors, granite counter tops in kitchen and baths, double sinks and walk in closets in the master bedroom, dual pane windows, double insulation and low maintenance desert landscaping, alarm system,"